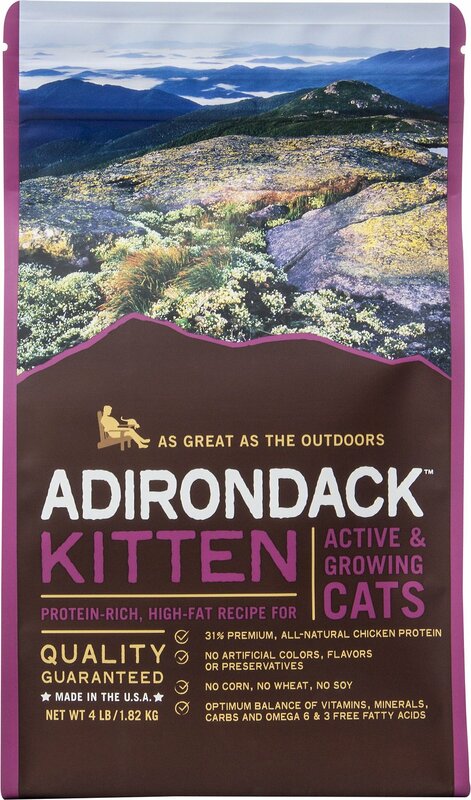 Feed your furry friend a food that’s as good as the great outdoors with Adirondack Kitten Protein-Rich, High-Fat for Active & Growing Cats Recipe Dry Cat Food. 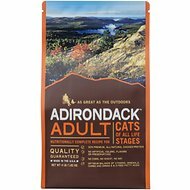 Formulated for peak growth, development and performance, this premium-quality, all-natural food is enhanced with essential vitamins, minerals and nutrients to deliver complete and balanced nutrition for kittens and highly active cats. 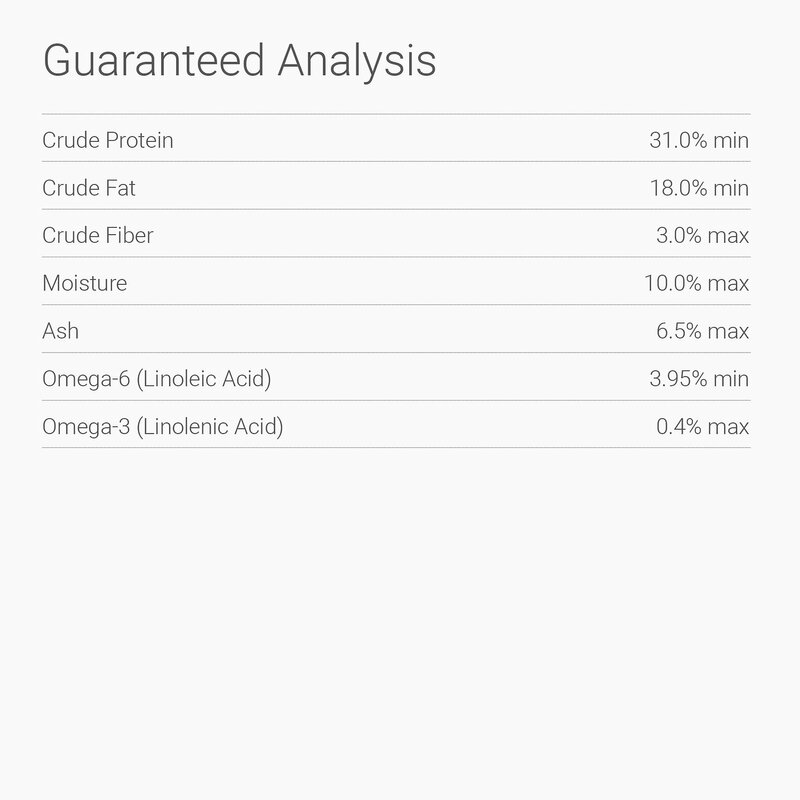 Added probiotics help support maximum nutrient absorption and overall digestive health, while omega-3 and 6 fatty acids help nourish her skin and coat. 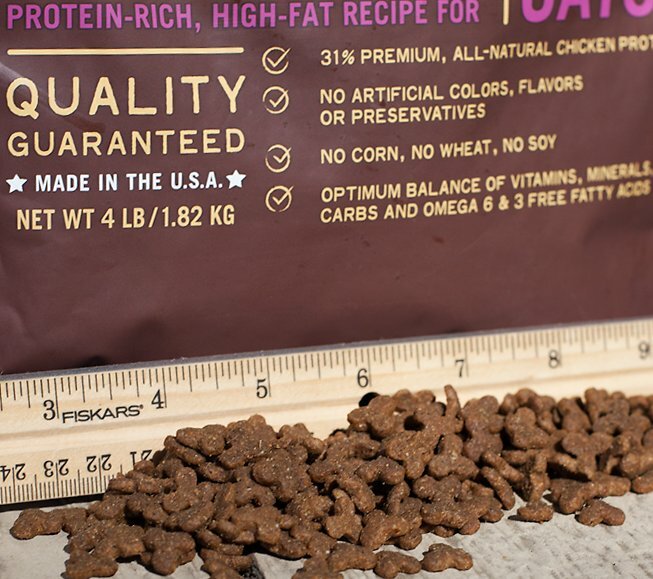 And because only the best will do for your favorite feline, it’s made in the USA without the use of corn, wheat, soy, artificial colors or artificial flavors. 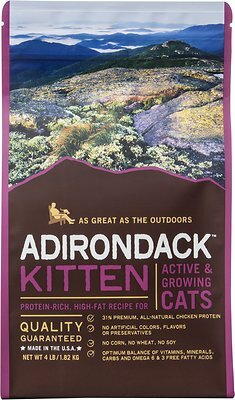 Premium-quality, all-natural food delivers peak growth, development and performance for kittens and active cats with 31% protein and high fat content. 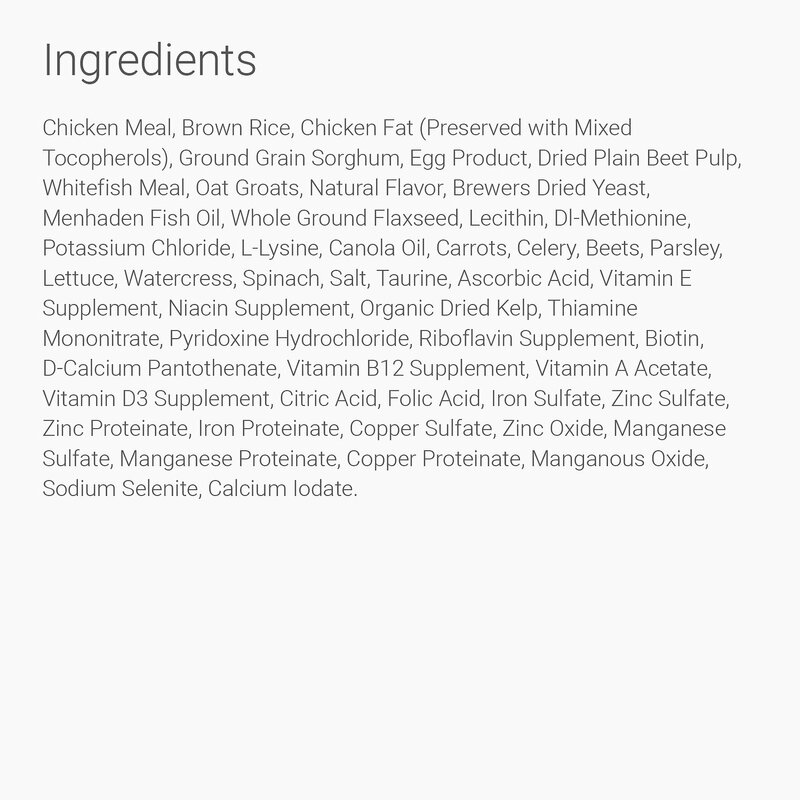 Chicken Meal, Brown Rice, Chicken Fat (Preserved with Mixed Tocopherols), Ground Grain Sorghum, Egg Product, Dried Plain Beet Pulp, Whitefish Meal, Oat Groats, Natural Flavor, Brewers Dried Yeast, Menhaden Fish Oil, Whole Ground Flaxseed, Lecithin, DL-Methionine, Potassium Chloride, L-Lysine, Canola Oil, Carrots, Celery, Beets, Parsley, Lettuce, Watercress, Spinach, Salt, Taurine, Ascorbic Acid, Vitamin E Supplement, Niacin Supplement, Organic Dried Kelp, Thiamine Mononitrate, Pyridoxine Hydrochloride, Riboflavin Supplement, Biotin, d-Calcium Pantothenate, Vitamin B12 Supplement, Vitamin A Acetate, Vitamin D3 Supplement, Citric Acid, Folic Acid, Iron Sulfate, Zinc Sulfate, Zinc Proteinate, Iron Proteinate, Copper Sulfate, Zinc Oxide, Manganese Sulfate, Manganese Proteinate, Copper Proteinate, Manganous Oxide, Sodium Selenite, Calcium Iodate. Free feeding is widely used and recommended for kittens. If free feeding is not your desired choice, follow the above set of suggestions. Fresh, clean water should be kept available to the cat at all times. Not for human consumption. 3 outdoor kittens. They love this food! We have some left over store brand, accidentally put that in their dishes instead of Adirondack. All three ran up and begrudgingly took a few bites. After connecting the dots, they were very pleased to have it replaced with this goodness. It's so dense! Their appetites are definitely more satisfied now. Will definitely continue to buy regularly. I tend to have fussy feral cats. I try to feed them plenty and desire quality food for fair price. This is a bit pricier then I'd like but I'm trying to find a food to please all kittens nursing mom and others. This is ok some like some don't. I mix with other food so they eat it. So far my little guy seems to likes this food. Always finishes it within a few minutes. Very good quality. I recently trapped and am trying to domesticate 2 feral kittens. I mix this dry food in with their wet food 2x a day, and they seem to love it. Chewy delivered the day after order, and I am, thus far, extremely impressed with their service. 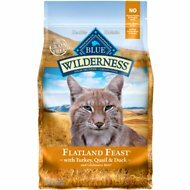 My kittens love this food! It keeps their coats very soft and shiny. I love this food for them because it's so natural and healthy for them with no GMO, fake added stuff or anything like that. HIGHLY recommend this! Great brand. My 6 week old kitten loves this food. It's dry and has all the nutriments she needs. Arrived promptly and high quality as usual, for nursing mama and eventually kiddos but she scarfs it right up!